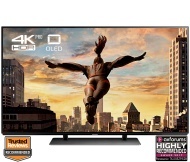 alaTest has collected and analyzed 196 reviews of PANASONIC TX55EZ952B. The average rating for this product is 4.9/5, compared to an average rating of 4.6/5 for other products in the same category for all reviews. Reviewers are impressed by the design and price. The sound and usability also get good feedback. Reviews about the energy efficiency and connectivity are mixed. We analyzed user and expert ratings, product age and more factors. Compared to other products in the same category the PANASONIC TX55EZ952B is awarded an overall alaScore™ of 89/100 = Very good quality. Great pictures great features. Easy to set up and get going. Highly recommend. Had the TV a few weeks and most impressed with it. Great picture and easy to navigate. Love my new tv. Richer sounds not only gave me a 6 year guarantee . They matched another electrical seller who I would prefer not to buy from. Cos that seller doesn't Know how...... they know nowt. One week from purchase and find it so easy to navigate the features. Suberb quality. V happy with it. I have had my Panasonic 55 OLED for just over a week now and I am really pleased with my purchase. The picture is fantastic and I am still finding extra features on it. It was easy to set up and I was up and running in about 30 minutes.